The Taylor Trading Technique (3 Day Cycle) was invented by George Douglass Taylor back in late 1940’s. His Technique is a short term, 3 Day Method to trade the inherently choppy nature of the markets. The easiest way to understand Taylor’s “structure” of the Market’s “3 Day Cycle” is to adopt his view that the markets are being driven and manipulated by “Smart Money”. His core premise was that the market is manipulated in stages which repeat over and over. These stages were manually recorded using his “Book Method”. In 1950’s eyeballing the “Book” was enough to predict the amplitude of the moves. However in today’s markets and the use of computers, this had to be improved so the “Electronic Trading Book” was the solution, and the “PTG/TTT e-Book”, which also included new developments, was created by Richard Boisvert; Professional Trader / Money Manager. With the “PTG/TTT e-Book“ we do not only have a better idea of the daily direction of the markets, but also of the possible levels of support and resistance to be achieved. 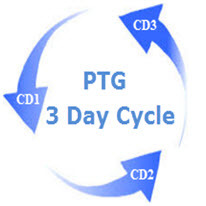 The “PTG/TTT e-Book“, today’s electronic version of Taylor’s 1950 “Book Method”, shows that even in Bear markets, the “Smart Money” creates a positive 3 Day Rally in over 84% of the cycles. We offer 5 different “PTG/TTT e-Books” covering a wide range of markets including: US Index Futures and Indexes; European Futures; Gold, Silver and Energy Products; Forex Futures; T-Note, Bond Futures and Interest Rate Indexes.